It’s that time of year again where we reflect on the year that is drawing to a close and look forward to the fresh new year that is on the horizon. I am lucky to have enjoyed so many unforgettable moments in 2017, it really is hard to narrow it down to this shortlist. The year has been filled with enriching moments, fun encounters and unforgettable experiences that have given me enormous pleasure in so many ways. You know how sometimes in life you meet people with whom you just click? This was most definitely the case for me when I connected with top US adventure bloggers Cathy and Frank on social media. It was clear from the outset that they were, like me, very much lovers of outdoors adventures. 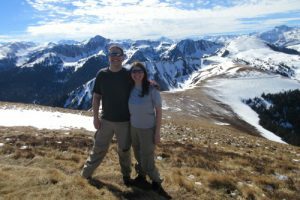 Their blog is full of fabulous trip reports from their adventures all over the world and in February I was finally able to welcome them to the Pyrenees. 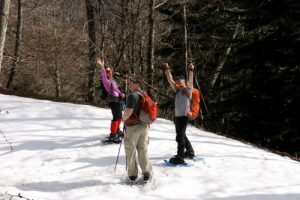 I created an action-packed week for them which included a fabulous off the beaten path hike up in the mountains with one of our top guides, Jean-Noel. 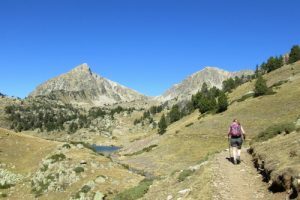 I always try and join clients on some of the adventures that we create so that I can get to know them and give them a more personal insight into this special corner of the Pyrenees. That day out was something special, especially seeing their reaction when they saw that jaw-droppingly beautiful view! I loved reading their write up of the outing on their blog and also to read about the other adventure-filled activities I had lined up for them including the quite frankly bonkers airboarding! Again, thanks to Social Media, in June I was able to meet the delightful and fun Viv and Jill from the women’s e-zine Wave Journey. It always gives me such enormous pleasure to introduce foreign travellers to the wonders and delights of this unspoiled area of the Pyrenees. I always hope that clients appreciate all the additional local information that we provide which is always backed up by our own personal experience. Although Viv and Jill really enjoyed both the guided hike with another of our top guides, Marc, and also our exciting river descent in the canoes, it was the food that made the biggest impression on them. When you’re visiting an area for the first time you’re never quite sure what to expect when it comes to the food. But the foothills of the Ariege Pyrenees is pure foodie heaven. Local knowledge helped me to send Viv and Jill to restaurants at which I knew they’d eat the very best local cuisine. 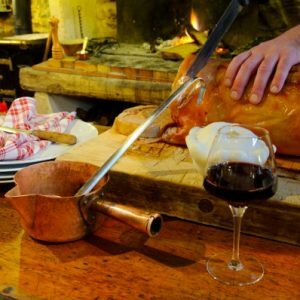 The highlight for them was the most delicious meal featuring home-cooked SW France gascon specialities at the Auberge d’Antan in Saint Girons. 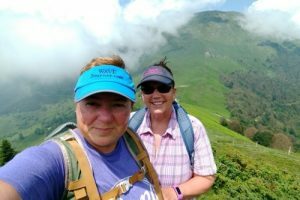 To hear the lovely ladies’ reaction to the eateries that I proposed really was an unforgettable moment and their write up of their foodie experiences in the Ariege Pyrenees was a joy for me to read! Pam is a solo adventurer. I had previously arranged two ski touring and snowshoeing short breaks for her here in the Pyrenees. Again, she was somebody that I just clicked with. 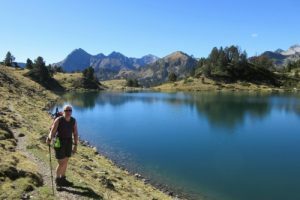 So when she contacted me to say she had plans to be in the Pyrenees again in the autumn I jumped at the chance to meet up with her for a hike. 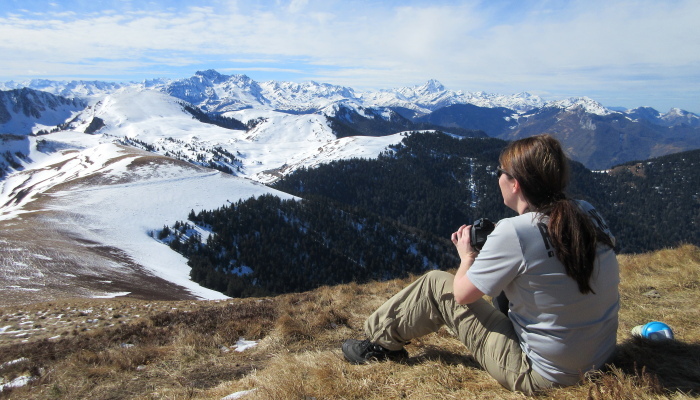 Her visit was the perfect excuse to explore some of the stunning Neouvielle Natural Park, an indescribably beautiful area of the central Pyrenees. The autumn colours were spectacular and the weather for Pam’s visit was simply perfect with temperatures into the mid 20s. We spotted the threatened bearded vulture, a cross-bill and also an alpine accentor, which was a real treat! We both took a ridiculous number of photos, talked and talked and talked some more, took more photos and before we knew it I had to head back to base. Where had the day gone! The job of creating adventures for fellow outdoor enthusiasts doesn’t feel like work when they ultimately become good friends with whom I can enjoy unforgettable moments such as this. I am one of those lucky people whose job is a genuine, unaldulterated pleasure. The adventures that I put together for people are usually adventures that I would like to have myself. One of the big highlights every year is our women’s XC mountain biking week. I just love XC mountain biking and I always join the group for at least one day of mountain biking. 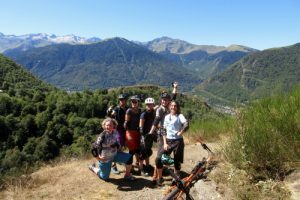 I know that in the capable hands of top guide Ian we’ll explore some of the totally amazing singletrack, tracks and trails of the Bagneres-de-Luchon area. 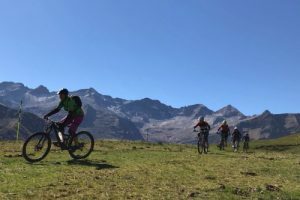 It’s always such a giggle riding with these like-minded lasses and amazing to see their reactions when we get up high and see those far-reaching mountain views! But the best bit is knowing that I have played a part in forging new friendships. The girls always keep in touch once they have returned home and invariably arrange to meet up for rides together in various parts of the country. Playing a role in enriching these women mountain bikers’ lives has to be one of the most unforgettable moments of my adventure year. Over 40 brown bears now inhabit the mountainsides of the central French and Spanish Pyrenees. 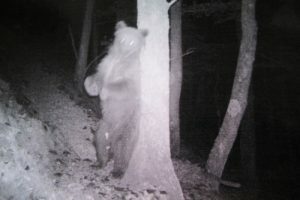 I wrote a blog post all about the bears in the Pyrenees, but until this year I had never been able to get close to them. As part of my research for our bear tracking wildlife adventure holiday I spent a day in the company of one of our local bear experts to find out how they track and monitor the population here. It was an incredible day on which we reviewed video footage captured by the motion detection cameras up in the bears’ territory and collected fur left by the bears on barbed wire collection points fixed to trees. It was an unforgettable moment when we saw footage of a bear rubbing against that tree right where we were standing! Since that day in May, I have been lucky enough to follow tracks in the snow made by a mummy bear and her two cubs and to spot other signs of their presence in the mountains. The bears are shy creatures but one of these days I know I shall see one in the flesh. I can’t wait! 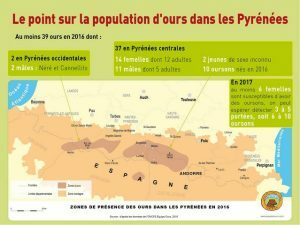 In early December I was delighted to meet a wonderful couple who had come all the way from Australia to spend just 10 days in France of which 6 were in the Pyrenees. In addition to a 3 day guided snowshoeing adventure, I had also arranged a winter tandem paragliding outing for them both. But the weather had other ideas. 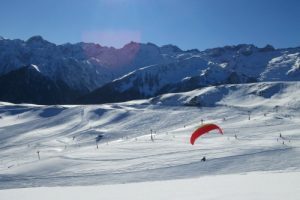 We had a big dump of snow on the day for which paragliding was scheduled. They were so disappointed that the descent could not go ahead. Their itinerary was pretty tight but thanks to my local contacts I was able to reschedule their flight for the very last day of their stay in the Pyrenees. It couldn’t have been better! 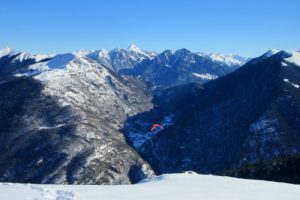 It turned out to be one of those pinch-yourself blue-sky days, perfect conditions for a paragliding descent from the Superbagneres ski station. I learned from Andrea that it also happened to be Heath’s birthday that day. What a way to celebrate! Then, later on, over a coffee, Heath confided in me that he had proposed to Andrea in Paris at the start of their visit to France and she had said yes! It was wonderful to have been a part of their special trip and to have created some amazing memories that would last them a lifetime. Playing an important role in their special visit to the Pyrenees was definitely one of my most unforgettable moments of 2017. What have been the highlights of your year? Do share in the comments below. I’d love to hear from you! Thank you for including us in your highlights of 2017! It was such a pleasure to meet you and explore the Pyrenees. We can't wait to go back, the photos of Neouvielle Natural Park are incredible! Cheers to more adventures in 2018. Thanks so much for commenting, Cathy! Happy adventuring in 2018!